The sentimentality and modesty of this relief reflect changing patterns of devotion in Italy at the time of the first flowering of the Renaissance. The ethereal, queenly Madonnas of medieval art have been superseded by a more human, and altogether more accessible conception of the Virgin. Here is a Madonna to be approached, perhaps kissed, and a Holy Child to be adored. Ferrucci trained in the famous Florentine workshop of Verrocchio, perhaps side by side with the young Leonardo da Vinci. 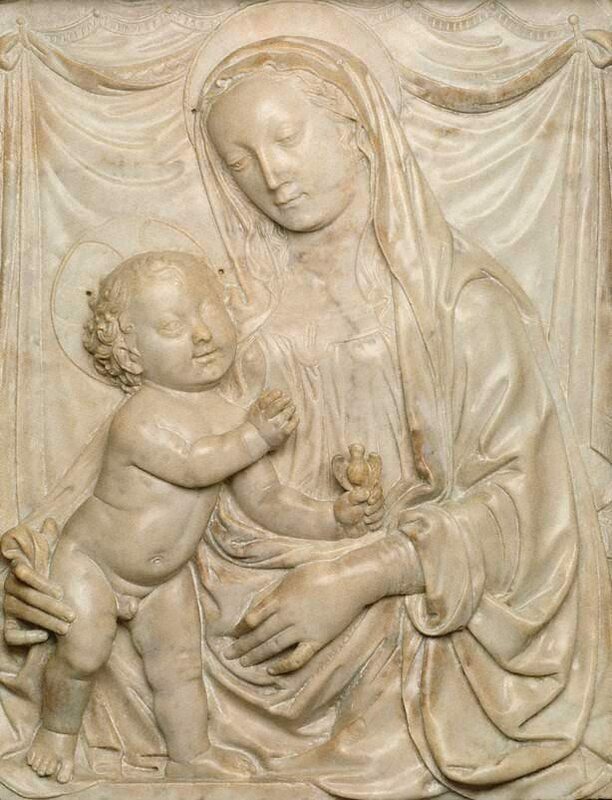 Certainly this marble manifests the essential sweetness that Leonardo elaborated on the basis of Verrocchio's manner. Though an artist of the second rank, Ferrucci surpasses himself in this work. The modulations of drapery, the naturalistic rendering of the figures - especially the rotundity of the infant Christ - and the attention given to Mary's look of dreamy reverie: all these contribute to a work of art that is at once sacred and secular. Sarah Cooper, Look , 'There's something about Mary', Sydney, May 2018-Jun 2018, p 80. Renée Free, Art Gallery of New South Wales handbook , 'European', pg. 36-56, Sydney, 1988, 36, 37. Renée Free, AGNSW Collections , 'The Western Heritage, Renaissance to Twentieth Century', pg. 108-172, Sydney, 1994, 110 (colour illus.). Bruce James, Art Gallery of New South Wales handbook , 'Western Collection: Paintings and Sculpture', pg. 17-77, Sydney, 1999, 19 (colour illus.). Australia's national collections , Sydney, 1980, 254 (colour illus. ).